Home » Celebrate » Halloween fun! At our house, we start Halloween celebrations early! 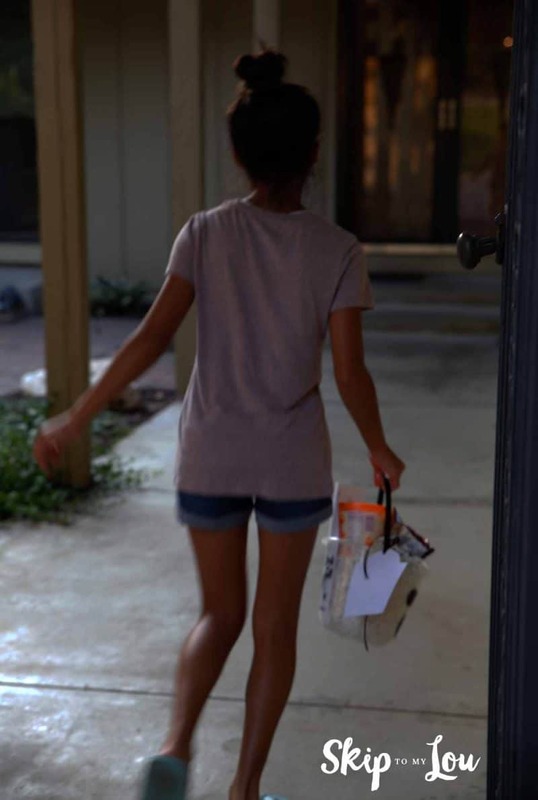 To get all our friends and family in the Halloween spirit we secretly drop treats at their door. I am sure you have heard of the tradition, You’ve Been Booed. 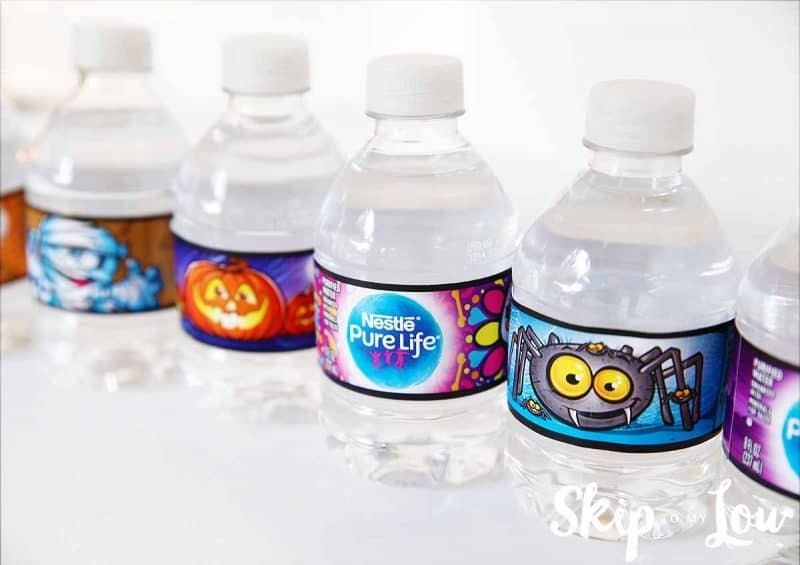 Running around the neighborhood works up a thirst, so when folks at NESTLÉ® PURE LIFE® asked up to show off their cute new limited Halloween water bottles we were all in! 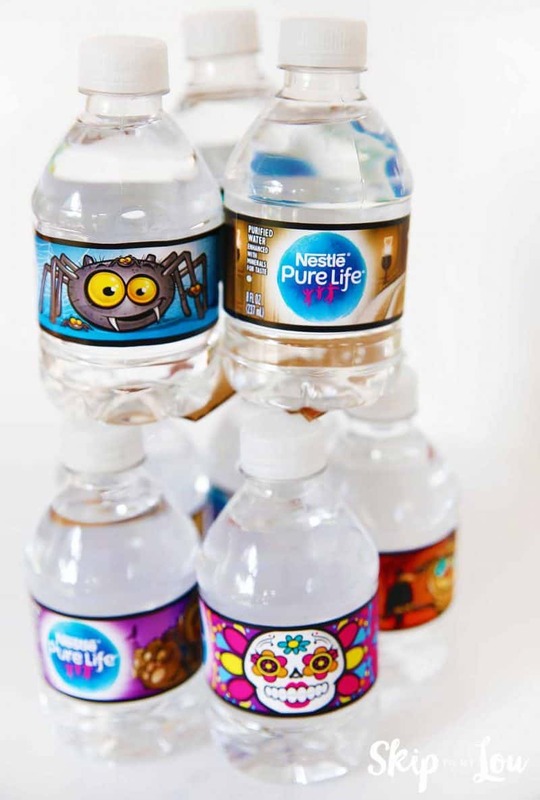 NESTLÉ® PURE LIFE® 8oz water bottles are the perfect size for trick-or-treating (or BOOing), making it easy for kids to stay hydrated throughout the night. We even think they would be great to hand out to our trick or treaters! With 8 different Halloween-inspired designs, they are the perfect addition to a classroom party or neighborhood get-together. Kids will gladly reach for this thirst-quenching treat! As a mom I often struggle getting my kids to drink enough water. In fact, I am not alone! Drinking water is one of the biggest “healthy habit” struggles moms have with their kids. So making drinking fun is a great help! 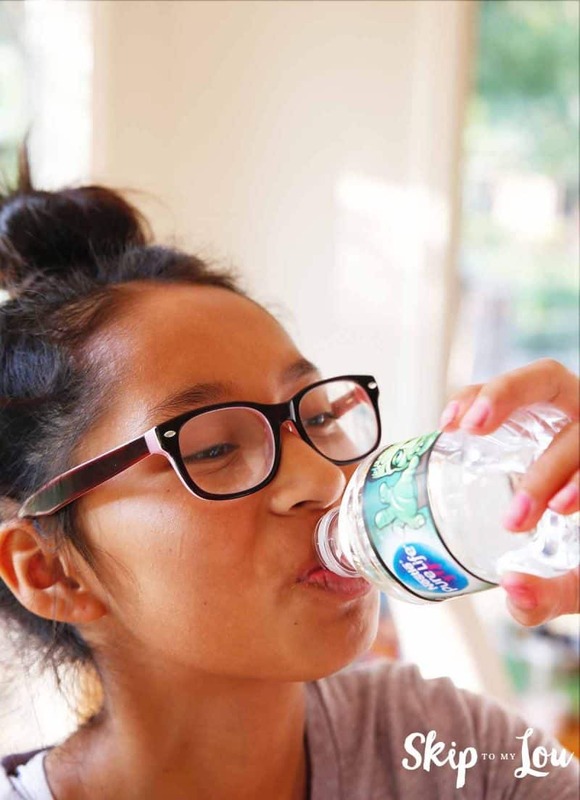 Kids have many choices when it comes to beverages and, unfortunately, research suggests that water is not always top of mind. One recent study found that more than half of US kids are inadequately hydrated1. Other findings highlight that up to 75 percent of kids report not drinking any water before school2 and that roughly 25 percent of kids report not drinking any water on two consecutive days3. Did you know that the Centers for Disease Control and Prevention’s (CDC) National Center for Health Statistics says that by replacing a single 12-ounce, 140 calorie sugar sweetened beverage with water each day for a year can cut more than 65 cups of sugar from one’s diet. WOW! I am happy to encourage more water drinking, and these darling water bottles making drinking water FUN! 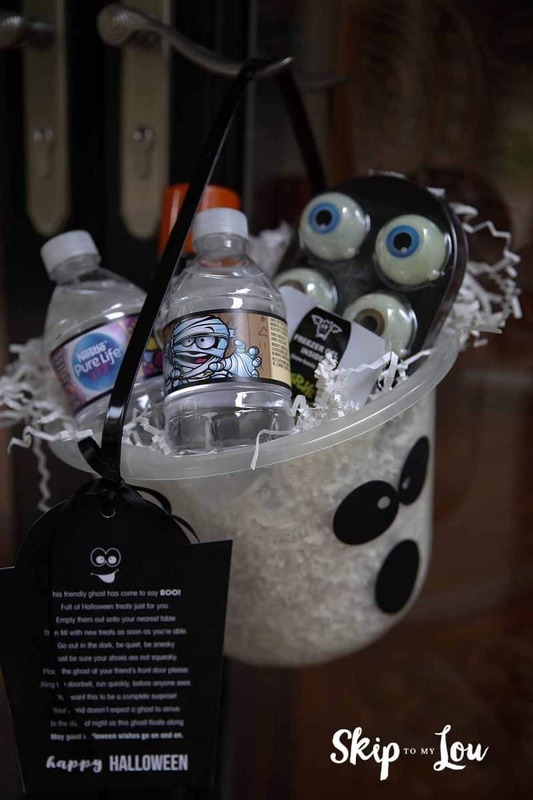 How cute are these bottles are in our BOO treats? If you want to BOO your friends, just download the printables. Print in black and white on white card-stock. Cut out the gift tag. Punch a hole at the top and add a ribbon to attach it to the bucket. The ghost will go inside the bucket with your treats. 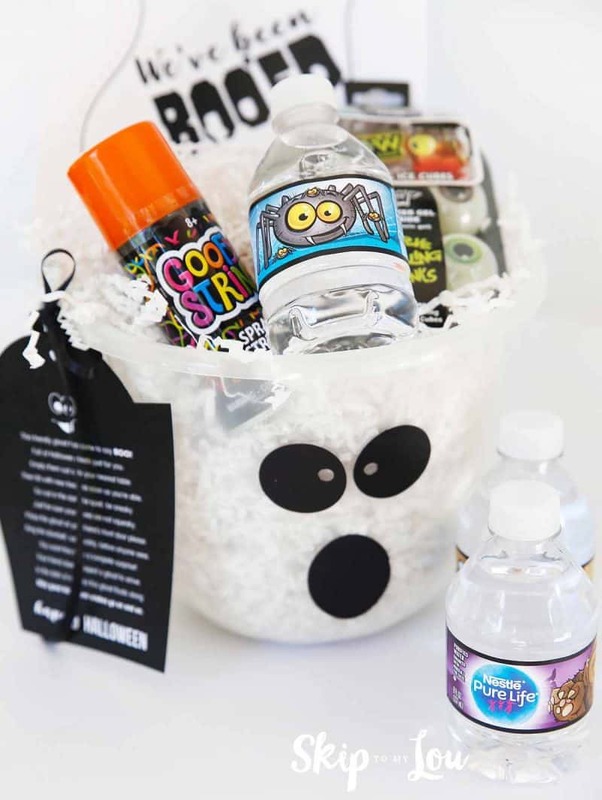 Fill a bucket full of goodies and attach the printable gift tag to the handle. Be sure to place the ghost in the bucket. 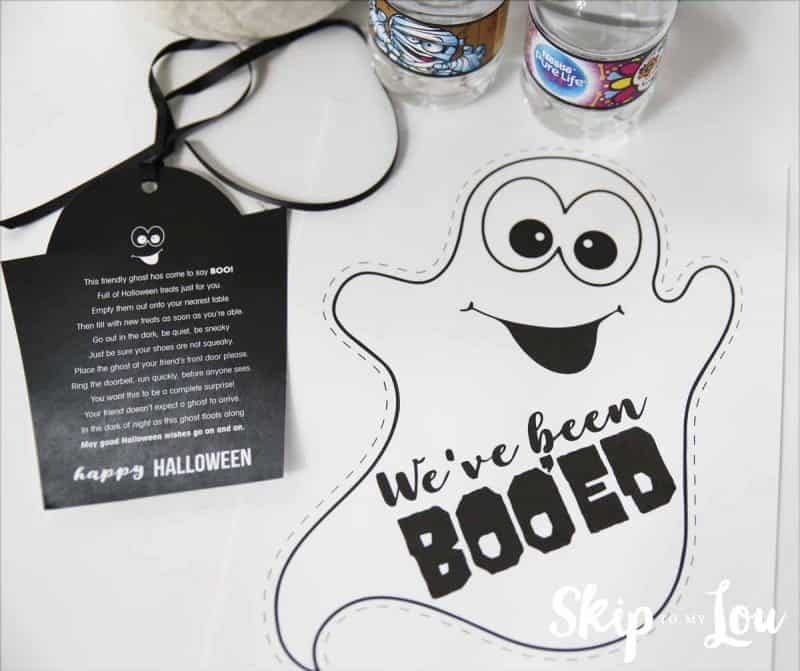 The recipient will put this ghost in their window to let others know that they have been BOOed. In the dark of night secretly deliver your goodies! We are going to do our part and keep hydrated this Halloween and also share a cute bottle of water with our friends so the Halloween fun goes on and on! This Halloween think outside the bottle and make healthy hydration fun for the whole family and take Halloween to the next level with NESTLÉ® PURE LIFE® limited edition 8oz water bottles! This is a sponsored conversation written by me on behalf of Nestlé® Pure Life®. The opinions and text are all mine. and water intake. Public Health Nutr. 2012 Nov;15(11):2148-56.
of 2005–2010 NHANES data Nutr J. 2013; 12: 85. Such a neat way to get kids hydrated. This will be my treat this Halloween. That is an awesome idea both for giving Nestle water as treats or just packing them along with the kids! It looks like the size make them easy to stow away in a backpack.